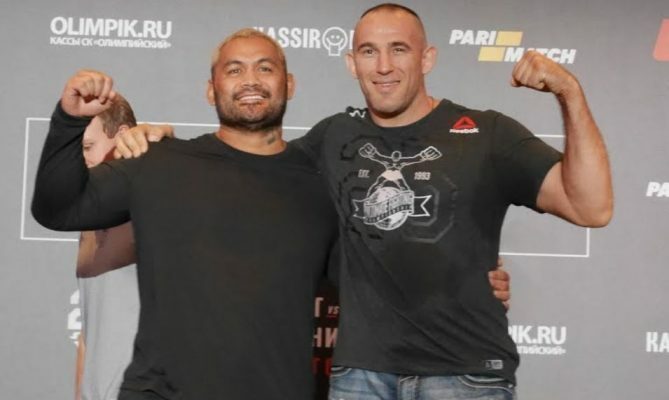 Can Aleksei Oleinik defy the odds and pull off another Ezekiel Choke at UFC Moscow? OHMBET are offering big odds. UFC Moscow goes down this weekend in Russia and our partners OHMBET have a special offer for MMANytt readers. Olienik has an extensive MMA record with 46 of of his 56 professional victories coming by way of submission and this weekend he will be looking to add to further add to his tally. With two vey unique Ezekiel Choke submission wins already in the UFC, OHMBET are offering special odds on Oleinik completing a Ezekiel Choke hattrick this weekend against Hunt. OHMBET are offering +700 – 8.00 – 7/1 on Oleinik winning via Ezekiel Choke submission and MMANytt readers can access the odds right HERE. MMANytt have been down on the ground all week in Moscow and today went to the UFC Moscow media day where they spoke to both sides of the main event.